Raw Mango Rice, a quintessential and traditional dish celebration the onset of summer or hot season. The arrival of mangoes signifies the onset of the mercurial season and what best way to celebrate than savoring its raw form and tanginess. Ugadi is celebrated across Telengana, Andhra and Karnataka during the months of March-April, specific date depending on the calendar. Raw mango rice is a non-negotiable dish as it signifies tanginess. Ugadi celebrates other food flavours of sweet, sour, bitterness, spicy, tanginess and salty. These are signified through other important elements like Neem Flowers, tamarind and Jaggery. A Traditional dish made for Ugadi, signifying the start of the summer season. Cook the rice as usual, but with less water (it must not be sticky). Let it cool. Grate the mango,with the skin. Keep 2 tbsp of grating aside. Add the cooked rice, add salt, & mix well. Add the 2 tbsps mango grating also, add coriander leaves. Serve with any raita or chips. 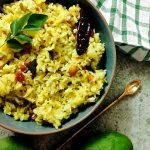 Feel free to comment or share your thoughts on this Raw Mango Rice Recipe from Awesome Cuisine.